I finally decided what to make for my Christmas table this year! So far I've made 10 of the 16 that I need - so I'm feeling quite pleased with myself! 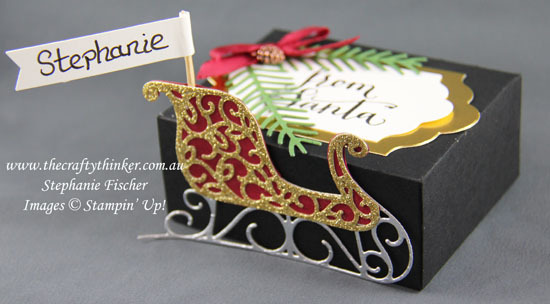 These little boxes will serve as table place names and little treat holders. 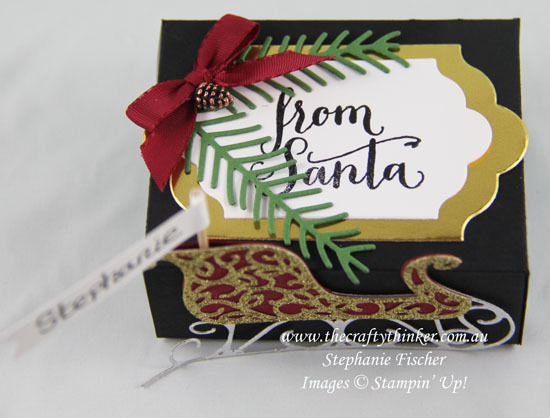 The boxes are really easy to make with the Envelope Punch Board and the rest is mostly just die cutting and gluing! Lined the edge of the cardstock up in the envelope punch board at 2 1/4"
Moved the cardstock along to line up at 4 1/4"
Rotated the cardstock to the next edge. Lined up the first score line with the Score guide. Repeated until all four sides were punched and scored. At one end, I cut along the score lines each side of the tab just as far as the next score line to form reinforcement tabs. At the other end I cut off the little squares altogether. To make the little banners, I used one of the dies from the Bunch of Banners die set and curled the end around a tooth pick before trimming off the sharp ends of the tooth pick. I didn't want the toothpick to show from the back, so I did add another layer of Cherry Cobbler to the back of the sleigh.